With more states considering the legalization of marijuana, an industry with a projected worth of $50 billion by 2026, cannabis has the potential to transform the American market in the coming years. Already, 59.3 percent of people in the U.S. live in a state where marijuana has been legalized and others are in the process of doing so, according to the U.S. Census Bureau. Still, many brands, fearful of hurting their reputations, will not engage. On Tuesday at SXSW, a panel of pioneering women in the cannabis industry discredited negative stereotypes about the industry and instead, gave a comprehensive look at emerging trends and the opportunities that are available, especially for women and the 50-plus market. Caroline Rustigian Bruderer, founder of cannabis technology start-up Simplegentix Inc. and branding consultancy K-Line & Company, led the conversation, "Legalized Marijuana: What’s Happening Now," with Emily Paxhia, managing director at assessment management company Poseidon, Gaynell Rogers, a pr consultant, and Shanel Lindsay, an attorney and founder of cannabis biotech company Ardent. One way to reverse the stoner stigma, said Rustigian Bruderer, is to create tastefully curated dispensaries that look more like polished, high-end retail stores, an effort to reach more consumers, essentially people that prefer stylish boutiques to the dingy hemp cafes like those found in Amsterdam. 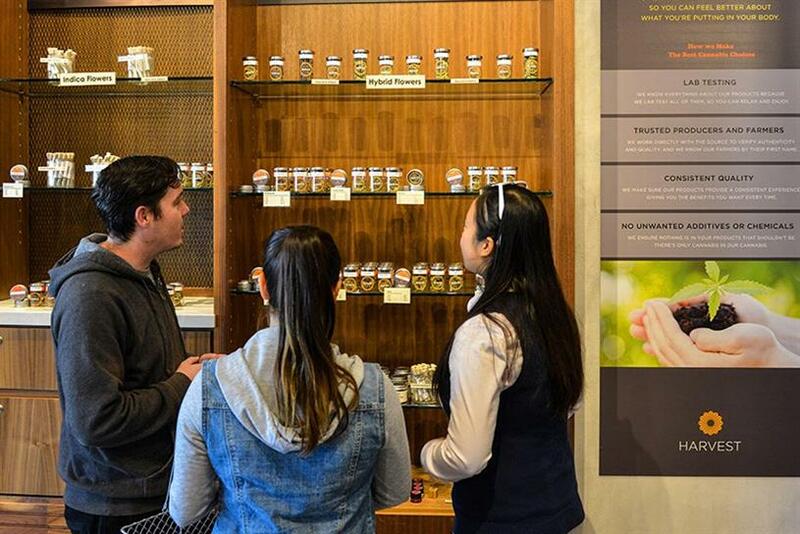 For instance, at Harvest, a dispensary in San Francisco, consumers are welcomed into a modern retail store that doesn’t scream cannabis. There are no marijuana leaves covering the walls. Instead, posters describe the medical benefits of the products showcased on wooden shelves. There’s also a members-only lounge. "It’s indicative of how the industry is becoming more accepting," said Rustigian Bruderer. "From the stoner, it’s developed into a sophisticated, elegant light." Cannabis products have also evolved. "I’m seeing more branded lifestyle products that address the different need states around cannabis," said Paxhia. "And it’s not about getting as high as humanly possible." Paxhia points to Whoopi Goldberg’s "Whoopi and Maya" line of medical cannabis products that work to ease pain like menstrual cramps. The branding of cannabis products has also shifted to reflect the upscale style of the new stores. This is especially true for ones marketed to females, said Paxhia. "When I first got into the industry, any kind of feminine-branded product was overt and pandering," she said. "Now we are seeing much more sophisticated and nuanced ones." Whoopi’s weed-infused medicines, like the Epsom bath salts or body balms, look more like "high-end products you might come across in a department store," she said. Beauty and wellness is a growing segment of the category, Rogers said. In the last year and a half, an executive at L’Oreal and another from Aveda expressed interest in implementing cannabis in their products with her, she said. And a variety of entrepreneurs are creating experiences around marijuana, such as Jim McAlpine, creator of 420 Games, a series of competitive athletic events that promote the healthy use of cannabis. The idea is to destroy the stereotype that cannabis users are lazy. He also plans on launching a gym called Power Plant Wellness in San Francisco by the end of 2017 with classes constructed around healthy ways to use cannabis. There is also a trend towards using all elements of cannabis, and not just the medical properties of the plant. "There’s 25,000 end uses for a cannabis plant, including the seeds for nutrition, the fiber can be used to replace petroleum in mass like plastics," said Paxhia. "It can also be used as graphite, the thing we use in the batteries in our phones, and could potentially give it a longer battery life." However, the panel stressed that although there has been much progress in the growth of the market in the past couple of years and an emergence of new applications for the plant, they admit it’s still a struggle to get governing bodies and brands on board. "We’re still on the advocacy side of showing people that this isn’t something to be afraid of," said Lindsay. "This is a multi-billion-dollar industry that’s coming." Many brands, said Rogers, are worried about their reputations. "People cannot, will not, risk their partnerships with their existing sponsors to enter the space," she said. That’s why women and the 50-plus consumer, who have been blocked by glass ceilings in other industries, have more of an advantage when it comes to starting their own cannabis businesses, mostly because the industry is so new. "We are building an industry from the ground up," said Lindsay, "and we have the opportunity to make the industry as diverse as possible." In fact, a study conducted by Marijuana Business Daily, 36 percent of all executives in the market are women. Still, to make green from this green, you have to be strong and willing to take rejection. "This industry can bring you to your knees," said Paxhia. "You have to guard your loins if you plan on participating."